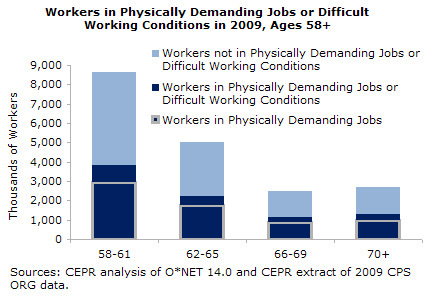 Employment in physically demanding jobs or in jobs with difficult working conditions is a major cause of early labor-market exit among older workers. Raising the retirement age is particularly concerning for near-retirement age workers with such jobs. Despite the fact that the retirement age increase is supposed to encourage workers to work longer, many workers would be physically unable to extend work lives in their jobs, and they would most likely be left with no choice but to receive reduced benefits. An increase in the retirement age or other cuts in Social Security benefits are also likely to put a greater burden on demographic groups that have higher proportions of workers in difficult jobs. In particular, physically demanding jobs and jobs that had difficult working conditions were more likely to be held by men, Latinos, the least educated (less than a high school diploma), immigrants, and the lowest wage earners.